Sentara Rockingham Memorial Hospital (RMH), in Harrisonburg, VA, will obtain the first Discovery NM750b dual head MBI system with Biopsy accessory on the east coast of the United States. Sentara RMH’s robust MBI program commenced in 2007 utilizing the Dilon single head molecular imaging system. “We are excited to now have the ability to biopsy those lesions only seen on MBI, and to expand our MBI program into surgical planning and treatment monitoring,” said Dr. Emily Ritchie, Radiologist at Sentara RMH Medical Center. Fox Chase Cancer Center in Philadelphia, PA, recently announced the addition of the Discovery NM750b MBI system as a complementary diagnostic tool to detect breast cancer after a questionable mammogram. MBI is now available to help physicians in the Philadelphia area detect early stage cancers even in dense breast tissue. “We find MBI with the Discovery NM750b system to be a proven and effective tool in the early detection of breast cancer when mammography is inconclusive,” said Kathryn Evers, MD, FACR, director of mammography at Fox Chase. The Discovery NM750b is exclusively distributed in North America by Dilon Technologies Inc. The recently FDA‑approved MBI biopsy accessory provides an additional tool to accurately localize the region of interest. “Dilon can provide the hospital and clinical data references upon request,” according to Pjerin Luli, Dilon’s Director of Sales and Marketing. With MBI, the patient receives a pharmaceutical tracing agent that is absorbed by all the cells in the body. 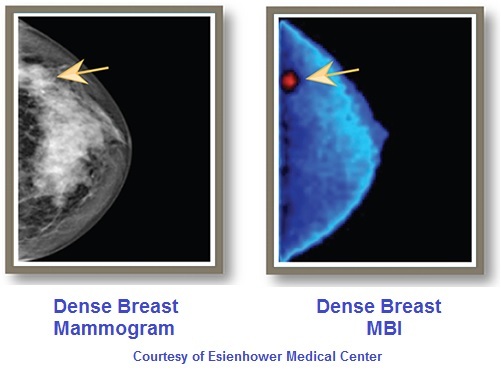 Due to their increased rate of metabolic activity, cancerous cells in the breast absorb a greater amount of the tracing agent than normal, healthy cells and generally appear as ‘dark spots’ on the MBI image. The Discovery NM 750b MBI system uses revolutionary and leading-edge, solid-state Cadmium Zinc Telluride (CZT) detectors to improve diagnostic accuracy in all types of patients.